1 » As OGGOA has reported twice previously, former Florida Gators defensive end Jermaine Cunningham hopes to turn some heads at the team’s second Pro Scout Day on Wed., April 7 at Ben Hill Griffin Stadium. Speaking with the Atlanta Journal-Constitution, Cunningham said he feels “100 percent” and is optimistic about his future. “To me, [playing DE or linebacker] is all the same,” Cunningham said. “I see myself as a football player. As long as I get on the field, when the ball is snapped, I’m going for the person with the ball. I’m very comfortable with both [positions].” As far as his decision to attend Florida (being a Georgia native)? “I felt it went pretty good,” he said. “Coming out with two National Championship rings, two SEC championship rings and a college degree. It was more than I expected.” He has received interest from nearly 20 teams in the league and has a private workout scheduled with the St. Louis Rams. 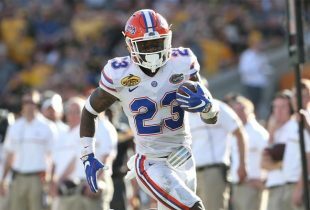 3 » Former Florida safety Major Wright has accepted an invitation to work out for the Miami Dolphins in South Florida on Friday. Wright, who has been steadily climbing draft boards after his respective performances at the 2010 NFL Scouting Combine and Pro Day, could be picked as high as the third round according to some scouts. 4 » Two more teams talking about quarterback Tim Tebow are the Minnesota Vikings and Philadelphia Eagles, both of whom plan to take a closer look at the former Heisman Trophy winner. Mike Wobschall, on the Vikings’ official Web site, believes the team would draft him with their second-round pick if he was still available. Sports Illustrated’s Peter King reports that the Eagles will “join the parade of teams working [Tebow] out and spending time with him” leading up to the 2010 NFL Draft.